Chris is the current CEO and CoFounder of the Irish Social Enterprise Network. Chris was the interim Director of Social Enterprise NI, the representative voice of social enterprise in Northern Ireland. Through the ExportCoop.ie, Chris brought together Irish SME exporters reducing business costs through cooperative means opening up new avenues for business growth. Chris is the Country Partner for the international BCorp movement and has spoken widely on the topics of doing well and doing good through business. Chris’ work focuses on social enterprise, entrepreneurship, social entrepreneurship, startups, cooperative development, exporting and small business in Ireland and Northern Ireland. 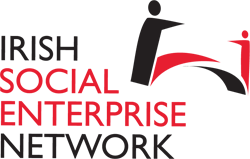 Through his deep and broad engagement with social enterprises, his experience reflects grassroots organisations. He engages on national discourse and policy development providing sectoral reporting, supports and proposals to government. Danielle Byrne is a doctoral researcher in the Trinity Centre for Social Innovation, Trinity College Dublin. Academic research interests include social enterprises (especially taxonomy and mapping methodologies), hybrid organisations, and institutional influences. I provide teaching support in Trinity for undergraduate modules on Business in Society and Social Entrepreneurship. In my earlier career I was CEO of Islington Chamber of Commerce, executive director of environmental regeneration charity Groundwork Hackney, regional director of Groundwork UK, and programme manager at Pobal with responsibility for the Community Services Programme, Rural Social Scheme and Tús. I have a long history of community activism of which perhaps my best days were on the board of social enterprise Walworth Garden. As a young woman I worked as a copy writer and have taken that skill with me – in recent years I was the Dublin correspondent for Plays International magazine and in 2017 edited The Runner McGeough – the Untold Story. Currently sitting in the Microsoft Customer Service & Tech Support EMEA Leadership Team Pascal is a Senior Business & Operations Leader providing executive support to an organisation encompassing 400 Full Time Employees and up to 1000 Vendors through 7 Technology lines of business in EMEA. He is currently managing a team of 18 individuals composed of 10 Directs Senior Business and Operations Managers and their respective Analysts teams With a strong customer centric culture based on active listening & proactive tracking including Customer Experience metrics and competitive intelligence, Pascal through his career has built numerous senior teams (up to 50 people) and divisions in multi-country dimension and cross boundaries set up set up. He has also led numerous World Wide developmental projects such as Global Enterprise Organization Capacity, Partner & Field Division Evolution or innovative adoption of technology such as RFID. On a day to day basis he has administered, guided or billed large billing transactions worth triple digits figures with direct impact on customer satisfaction & market share value. Multi Award Winner Pascal is a driven individual whose executive maturity enabled him to drive multiple flagship initiatives such as the launch of a well-known Game Console in EMEA Pascal has also driven the executive relationship and acted as liaison officer between the entire Microsoft General Manager Community in Central & Eastern Europe and the European Operations Centre for which he received the EMEA Champion GM award in 2012 With a strong humanist ethos Pascal always put the organic growth of an organisation first while balancing out the strategic need of execution. Emma McEvoy is a Ph.D. candidate at Maynooth University, Department of Law. Emma’s research interests revolve around public procurement legislation and the inclusion of social clauses in public contracts. Emma graduated with a BA in Economics, Politics and Law from DCU in 2007 and an MA in Development in 2009. Emma was employed as a legal research assistant from 2011 to 2013 on the Interreg EU funded “Winning in Tendering” project. Winning in Tendering is strategic research project aimed at transforming the public sector tendering experience of small indigenous suppliers. Emma was responsible for assessing the impact of the EU Public Procurement Remedies Directive on small suppliers selling into the Irish public market. Over the last three years, Emma facilitated a variety of training programmes for public procurers and SMEs. Emma is a co-author of the Dublin Chamber of Commerce’s “Are tenders on your Radar” report and co-author on a social-enterprise orientated “How to Engage in the Public Sector Market” guidance document. Emma strives to re-examine the key ideas and assumptions that shape the production of knowledge in this arena.